Pakistan Broken Rice Exporters for Dar es Salaam, Tanzania. 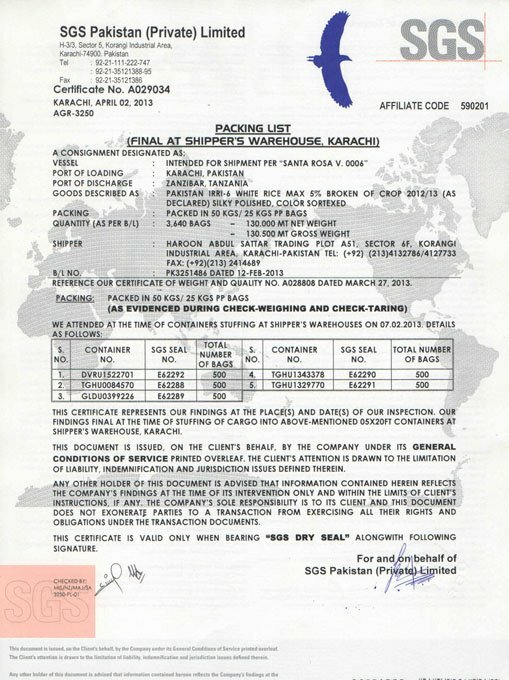 Pakistan (100% Broken) White Rice Exporters for Dar es Salaam, Tanzania. Tanzania occupies an area of 945 027 km 2 and an estimated population of about 30 million. The Government of Zanzibar has been more aggressive than its mainland counterpart in instituting economic reforms and has legalized foreign exchange bureaus on the islands. Furthermore, with external funding, the government plans to make the port of Zanzibar a free port. According to a governmental survey in 2009, Rice consumption is measured at 20.1 kg milled rice per person per year in Tanzania. Pakistan 25% broken white rice and Pakistan 100% broken white rice is very popular due to its excellent quality & taste in Tanzania. Our company, HAS Rice Pakistan specializes in exports of Pakistan 25% broken white rice and Pakistan 100% broken white to Tanzania. HAS Rice Pakistan is a leading Pakistan rice exporter to Dar es Salaam, Tanzania amongst other West African nations. We are known for excellent quality white rice, competitive pricing, enormous rice processing and milling capacity and state-of-the-art infrastructure - enabling us to deliver value for money for our esteemed customers time and time again. CNF Dar es Salaam, Tanzania. Should have at least 2 years remaining shelf life upon arrival in Tanzania.